Breakfast is one of my favorite meals of the day (my others being lunch and dinner), however I rarely go to the effort of making it. It’s usually something quick like a scrambled egg or a bagel and some fruit. 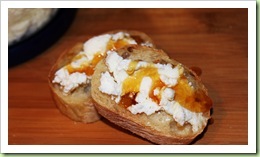 But, with guests in the house, breakfast is very much worth the effort. 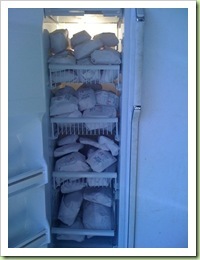 I recently purchased 1/2 a pig from the Farmer’s Fresh Market, so I had a copious amount of fresh sausage in my freezer. Also on hand were about 4 dozen eggs, some frozen blueberries and a small bag of dried cherries I’d picked up from Trader Joe’s. Those few ingredients turned out a rather delicious array of breakfast goodies, if I do say so myself! 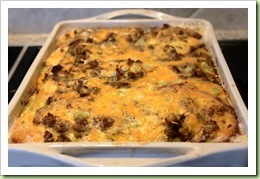 Cowboy breakfast casserole, courtesy of www.epicious.com. Garlic-butter spread on slices of Italian bread, topped with browned sausage, green onions, cheddar cheese, and my two dozen farm-fresh eggs! 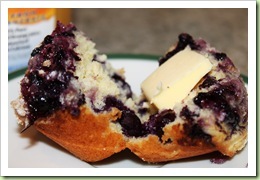 The world’s best blueberry muffin, recipe from Cooks Illustrated. The clincher in this recipe is taking a cup of the frozen (best quality you can find) blueberries and bringing them to a simmer with a teaspoon of sugar, mashing up the blueberries as they cook. When reduced to about a 1/4 cup, let cool and then drop a teaspoon full on top of each muffin, swirling into the batter. Top all of that with a little lemon sugar (lemon zest tossed with sugar). I had a Meyer lemon on hand, which made the lemon sugar topping all the more delicious! 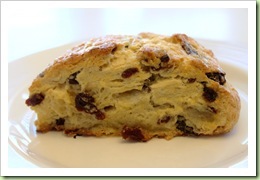 And finally, cherry-vanilla scones, recipe from www.finecooking.com. These are nothing like the hockey-puck type scones you find in stores or at Starbucks, these are the real deal! 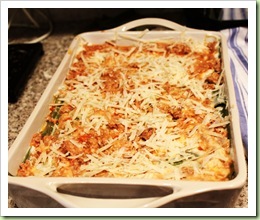 And so easy to throw together! Our good friends the Rawlins came for a visit this weekend. We had a great time! The kids were excited to have friends over and they had the rather unexpected treat of almost 4 inches of snow on Saturday! The best part of having friends over is being able to share a great meal with people you love. 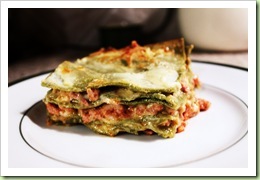 I checked out this book from the local library, and in it found a great recipe for traditional lasagna, using a Mario Batali ragu recipe at its base, bechamel, and fresh spinach lasagna noodles. I made the ragu and bechamel as written, but bought the fresh noodles from Pasta and Provisions, because really, why go through the laborious process of rolling out your own noodles, when they can be found right up the road! The result was rich and glorious! And for dessert, homemade tiramisu! Instead of using the traditional lady fingers, I made a coffee-infused sponge cake. 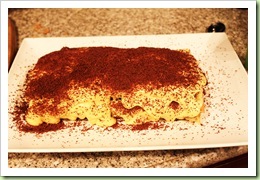 The result, in my opinion, is a much lighter version of the original tiramisu. The eggs used in the sponge cake and mascarpone cream filling are from local farmers via the Farmers Fresh Market. 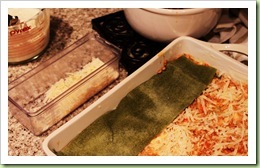 The recipe is from www.finecooking.com. We had some good friends visiting this weekend, so in the rush to get everything cleaned/prepped on Friday before they arrived, I neglected to eat lunch. Or breakfast. So by the time the afternoon rolled around and I could stop and catch my breath, I found myself starving, but not wanting to make a meal – because I had a rather big meal planned for that evening. I had picked up a couple of loaves of French Bread from Pasta and Provisions, makers of the best French bread I’ve ever had, earlier in the day. In my purse, I found the small sample of local honey that my friend Kirk from the Farmer’s Fresh Market had given me. 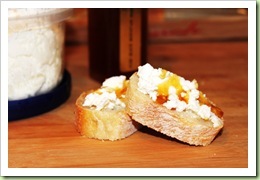 And in the fridge, a tub of local, fresh Chevre, also procured from the Farmer’s Fresh Market. Those three simple ingredients turned into one of the most delicious and addictive snacks I’ve ever had the pleasure of eating!